A Palatine man was acquitted of first-degree murder charges in early June following a jury trial. The defendant sent a fellow bar patron to the hospital following a single punch to the head; the victim died 10 days later. The defendant claimed he threw the punch in self-defense during a bar brawl. The defense in this case was a two-pronged approach that involved self-defense and lack of specific intent. In this case, the victim died 10 days after being punched in the side of the head by the defendant. A forensic expert testified that the majority of the brain damage suffered by the victim was a result of the blow to the head, and not the subsequent fall to the ground. Jury verdict aside, it is difficult to see how the prosecution could successfully argue that the defendant had the specific intent required for a first-degree murder charge. The punch occurred during the middle of a bar fight, where many participants were throwing punches and putting hands on each other. There was no indication that anybody was intent on causing deadly harm – it was just an ordinary bar fight, and the defendant jumped into the fray. His intent was to hit the victim, not to kill him or cause great bodily harm. Nor does it seem plausible at all for the defendant to have known that his punch to the side of the victim’s head could result in death or great bodily harm. 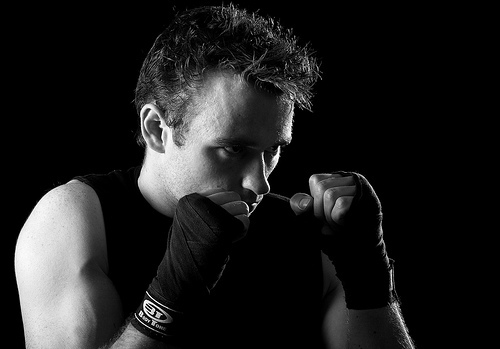 Unless the defendant was a prizefighter – and even prizefighters take heavy blows to the head on a routine basis and do not die as a result – nobody would believe that a bare-knuckled punch to the head would result in anything worse than a mild concussion. No laughing matter, but certainly not great bodily harm. Without the victim’s subsequent death, the defendant committed battery – not aggravated battery – so the crime does not meet the criteria for first-degree murder under the forcible felony rule. Under Illinois law self-defense is an affirmative defense for the use of force. The use of force must have been based on a reasonable belief that the action was “necessary to defend himself or another against such other’s imminent use of unlawful force.” The use of deadly force, or force likely to cause death or great bodily harm, is justified only to defend against similar use of force. In this case, regardless of whether the defendant has a reasonable belief that the victim was about to assault either the defendant or his friend (which was the defendant’s justification for his use of force), the same argument against a conviction for first-degree murder applies here. There is no way the defendant could have known that a punch to the side of the head was going to result in the victim’s death. That the punch did cause the victim’s death was a freak accident. The prosecution in this case gambled with an all-or-nothing approach and lost. Instead of allowing the jury to convict the defendant on lesser charges – manslaughter or felony battery, for instance – the only option offered was first-degree murder. Once the jury decided that the defendant did not have the requisite intent to convict on a first-degree murder charge, they had no choice but to acquit. First-degree murder is the most serious crime a defendant can be charged with in Illinois. Defendants who are convicted face the possibility of life in prison without the possibility of parole. If you have been charged with first-degree murder, do not waste time in contacting Chicago murder attorney David L. Freidberg. With almost 20 years’ experience handling Chicago first-degree murder charges, David L. Freidberg has the resources, tenacity and skill you need to mount an aggressive defense. Call our Chicago, Skokie or DuPage County office 24/7 at 312-560-7100 to schedule your free initial consultation.